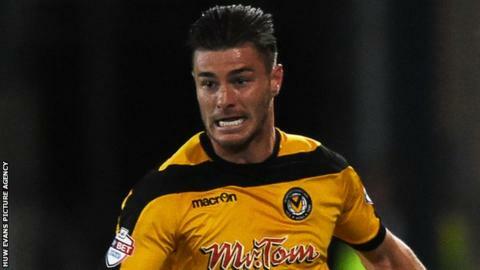 Defender Andrew Hughes will be on the Newport County bench against Accrington Stanley on Saturday following an 11-month injury absence. Hughes, 23, suffered an anterior cruciate ligament injury against Stevenage in December, 2014. He played 70 minutes for the reserves against Swindon this week and manager John Sheridan is delighted to have him back. "It's been a long journey for him," he said. "I've been there myself with long-term injuries. He's been patient and worked really hard and he looks really fit at the moment. "People in the team will know he's going to be pushing for a starting place." Newport will be without midfielder Tommy O'Sullivan for Saturday's game at fourth placed Accrington Stanley. O'Sullivan, 20, on-loan from Cardiff City, is with Wales' Under-21 squad for the Euro 2017 qualifiers against Armenia and Romania. Striker Lenell John-Lewis will be fit, despite not training since picking up a slight thigh injury in last Sunday's 2-2 draw at Brackley in the FA Cup. Sheridan is confident his side can build on two successive away wins and get at least a point against a side who have won seven of their last 10 games. "They play really good football. It'll be a good test for us," Sheridan said. "But we've proved it ourselves in the last month or so that any team can beat another team. "We've played three of the top teams and I wouldn't say they were any better than us. We've just got to try and stay on the run we're on."